Tools for curling hair have been around for hundreds of years and the curling iron itself has been around for a while. 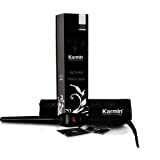 Supposedly invented in the 19th century by a Frenchman called Marcel Garteau, it was actually the American inventor Hiram Maxim who held the first patent for a curling iron around the same time. Needless to say, the technology behind curling irons developed over the years and has turned into the curling wand. 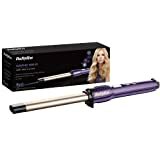 With materials and technology becoming cheaper and smarter, newer curling wands are so packed with features that it can be difficult to know which one is for you. You need to know whether spending loads is sensible or whether getting a bargain will still do your hair justice. Research and comparing curling wands is a time-consuming task and who wants to trawl through pages and pages of products that are just selling individual wands? We’ve done all that research for you, looked at the big and little differences, and checked out the prices so you can get all the vital information in one place. Neat eh? Curling wands are essentially curling irons/tongs without the clamp and are slightly more fiddly to use as a result. Curling wands are single barrels, either conical or one width, usually have a cool tip and are to be used with a heat-resistant glove. Because there is no clamp to hold hair in place, the hair must be wound manually around the wand rather than the barrel being wound up the hair, as with curling tongs. A naturally occurring gemstone that emits negative ions that smooth hair and seal cuticles. The use of negative ions has been used for a long time in hair care, especially with ceramic. Tourmaline actually produces considerably more negative ions than ceramic does but it’s usually mixed with ceramic to coat the barrel. It’s smooth, allowing for hair to move easily and snag-free across the surface. Also producing negative ions, ceramic is a very common barrel coating material. Many brands use the term ‘ionic’ to help sell the product but, actually, if it’s made of ceramic, it’s ionic anyway, as is tourmaline. 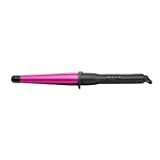 Ceramic heats very evenly and means that the heat should be the same whichever part of the wand you’re using. The prefix ‘nano’ to any material just means there are tiny amounts of that material present. In hair appliances this is usually nano-silver, nano-gold or nano-titanium. These small additions of other metals have specific properties such being anti-bacterial. There are some heated hair tools that are made of other materials and metals, some of which can seriously damage hair. Ceramic and tourmaline are very much the best and are widely used by salons and professionals everywhere. 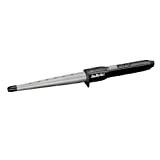 For years curling irons have had a clip which secures the placement of the hair to the tool. This may be easy to use but it has a tendency to leave an unsightly crimp and ruin the natural look of your curls. The main advantage of using a clipless curling wand is that you’ll never have those crimp marks and your hair won’t be randomly bent where the clip would’ve been. A further benefit of using a wand over a tong is that there is a much wider range of curls available to you, with just one tool. Without the clip to design around, wands are easily found in tapered, conical shapes which means that you can get tight ringlets or larger, looser and bouncier curls without having more than one tool. With a wand you can get right up close to the roots with ease and there are no extra bits to snag or tangle your hair. Without a clip to faff around with, once you’ve got the hang of using a wand it can be really fast and simple to make the perfect curls. 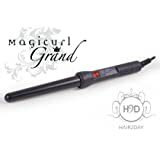 Almost all curling wands come supplied with a heat-resistant glove and a high quality one will allow you to speed-use your wand with no concerns. How do I Find the Best Curling Wand For Me? First you need to ascertain your price range and the look you want to achieve. If you’re looking to get very pronounced, tight curls then look for a curling wand that is conical and can achieve the smaller size of curl that you want. Getting a high quality tourmaline wand is a good idea for this type of curl as it works really well to smooth down the hair and do the curls justice. If you’re looking for beach girl waves or bigger, looser curls then you can try a constant width barrel or even a waving wand. These are both perfect for those large, bouncy curls and work best on longer hair. Look out for the adjustable temperature details too; if you have fine, delicate hair that reacts quickly to heat then you’ll want a wand that has an adjustable temperature and a good low temperature of about 140˚C. If you have tougher, less responsive hair then a wand with a good high temperature between 200˚C and 220˚C would be good. Smaller factors apply to the decision too, but once you’ve got the right price and right type of look, you’re pretty much there. Features such as an auto shut-off, long power cord and free heat mats may also play a part in your decision. The look of a curling wand is also something to think about; are you planning on just using it for special occasions so it’ll live in a box out of the way most of the time, or are you planning on using it a lot – in which case you might want to go for a design that matches your personal taste. Remington has a good reputation and this curling wand doesn’t do anything to compromise that. It’s one of the few wands that are setup for worldwide voltage which makes it very useful for holidays and has widely variable temperature settings. The pearl ceramic material that covers the barrel is harder than plain ceramic and has superb longevity. It also heats evenly and is exceptionally smooth. 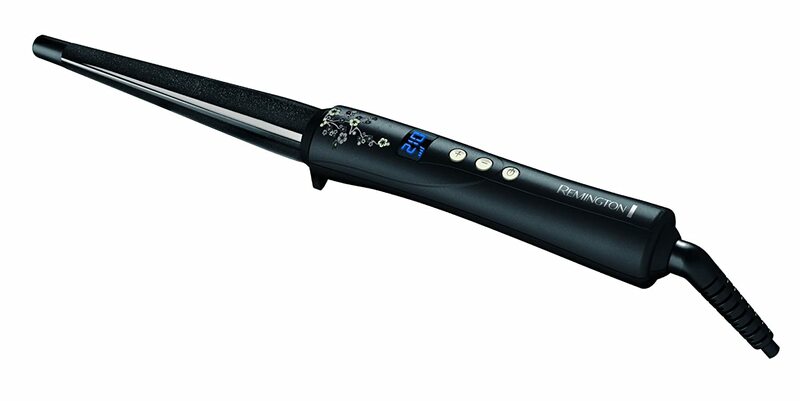 This wand heats up in 30 seconds and the LED screen shows you the temperature you’re at – this means damage by burning delicate hair is a thing of the past. It comes with a heat-proof pouch and a heat-resistant glove which works really well and it has an auto shut off feature for forgetful people. The 3 metre power cord may be useful in salons but it can be annoying in smaller bedrooms. This depends on your socket layout though; it could be a blessing for some. For those who are not just looking for an effective wand, but also an aesthetic appeal – this wand has small flowery detailing on the handle and is jet black. Very affordable, there are few downsides to this wand and it produces brilliant curls without much effort at all. BaByliss are another industry giant and are fairly reliable creators of hair appliances. 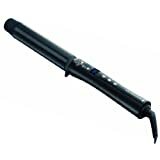 With five temperature settings, this curling wand gives you a good range of heat options that should easily suit any hair type. It has an in-built heat stand and an auto shut-off (although it’s at 72 minutes which is a long time) so you shouldn’t inadvertently cause any heat damage to your room and it gets up to 210˚C. The truly great thing about this curling wand that all others lack is the Wrap Control™ technology. Because there are no clamps in the design of curling wands, it can be tricky to get hair to stay where you wind it on the barrel. If hair slides up and down the barrel, it will compromise the quality and look of your curls. BaByliss have included a unique technology in this wand that sees tiny silicone bobbles up one side of the barrel – these cause the hair to stay where you place it. This actually makes a huge difference to the ease of use and gives great results. This wand has a nice length swivel cord at 2.5 metres and comes with a three year warranty. It’s really affordable and the wrap technology makes it difficult to beat. It doesn’t look like the most attractive wand in the world, but if effect is more important than design to you, this is the wand you want. 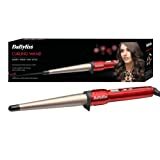 Another appliance from BaByliss, this wand is very different to the others in their range. Instead of having a cylindrical or conical barrel, this oval shape is designed to give the perfect waves rather than curls. Getting natural looking beach waves is no problem with this wand and if you’re trying to steer clear of the more defined curls, this is ideal. 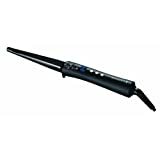 It’s great for longer hair and can handle delicate or stubborn hair with its five heat settings. Although it doesn’t have the above Curling Wand Pro’s Wrap Control™ technology, hair actually stays on the barrel fairly easily thanks to the different shape. A lot of people don’t want the bouncy curls and more contrived look that curling wands usually give and so the waving wand is the best alternative. It heats up fast, stays evenly hot thanks to the nano-gold ceramic construction and, again, has a 72 minute auto shut-off. 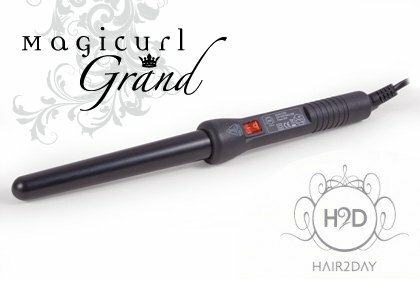 Slightly more expensive than the BaByliss curling wand, this waving wand is a flawless choice for those wanting natural looking waves. It won’t really create curls very well so it’s a good choice if you only want waves and is still very affordable. The handle looks a bit cheap and plastic-like but it is comfortable to hold and does the job well. This curling wand is from a pretty unknown company and is comparably expensive to the bigger known brands. Although it heats up to 230˚C, it doesn’t have a variable temperature meaning it’s 230 or nothing. This could spell disaster for delicate or fine hair and, if you planning on using it a lot, could even damage more robust hair. With such a high temperature combined with no auto shut-off switch, this wand doesn’t inspire confidence. Unusually, there’s no cool tip at the end and although the glove is good, it would still be reassuring to have a cool tip. Saying that, this wand does create good curls that stay for a long time and leaves a decent shine on the hair too. 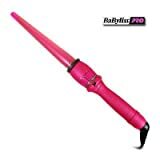 The barrel heats up in just 10 seconds which is very impressive and means you can create curls super quickly. This wand isn’t bad but it just doesn’t have enough features to justify its price. 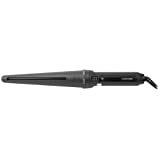 There are many curling wands out there that are cheaper and have more features, such as variable temperature and auto shut-off. While it can be difficult for a small company to get the exposure to break into the market, this Hairstyler appliance just isn’t really good enough to be much of a contender. To top it off, the ‘exclusive handmade box’ is just a regular box and calling it anything other than that doesn’t do much for the brand’s sincerity. H2D are relative newcomers to the public hair appliance industry but, in contrast to Hairstyler above, they have a real international presence and have won a lot of awards. The Tourmaline barrel gives hair a really good shiny, smooth finish and the curls last for ages. It’s plain black and has a simple design with a 25mm tapered barrel. It heats up in 60 seconds which is quite a long time, despite the brand claiming that it’s fast. The strange thing about this wand is that it doesn’t have variable temperature. This is strange primarily because the company’s website explicitly talks about the importance of variable temperature hair appliances. As a result, once up to temperature the barrel is at a constant 220˚C which is okay for stubborn, thick hair but could well be too hot for fine or delicate hair. If you know your hair likes it hot, then fine, if not, this won’t be of much use to you. This wand produces nice curls and gives hair a really good finish. However, the price is pretty high and it doesn’t have anything going for it that cheaper models don’t. Overall, this wand will do the job but it won’t knock your socks off and it comes at a fairly hefty price. So now you have seen our top picks it is up to you to choose the best curling wand to meet your needs and fit your budget. 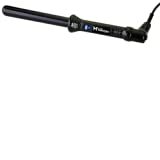 Check out all our curling wand reviews. Let’s fill that hair with those thick luscious curls you’ve always dreamed of! New curling wands are being introduced to the market all the time so we will update the comparison chart as they are introduced. If you feel like we have missed a superior curling wand that needs to be included urgently then get in touch with what you think the best curling wand is!